My Journey to Fit: Tommie Copper Compression Clothing Review and Giveaway! Tommie Copper Compression Clothing Review and Giveaway! I'm back with another review and giveaway for you - this time, it's Tommie Copper compression clothing! 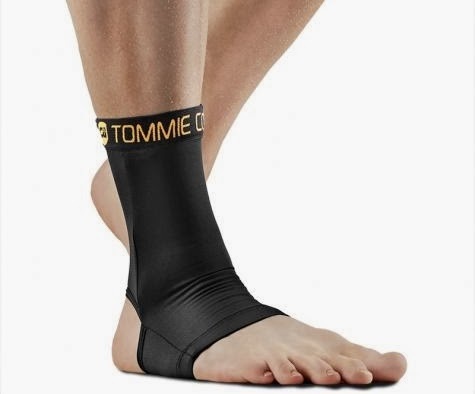 The company rep reached out to me, offering compression gear for my hamstring, as well as my choice of other clothing, plus they sent an ankle sleeve for Jeff to wear for his inflamed tendon. According to their website, Tommie Copper permanently infuses high density activated copper into their performance clothing, which releases ions, which may help reduce the oxidants in the body, among other things. You can read more about that here, if you're interested. The skeptic in me highly doubts this, but I do think that compression clothing (with or without copper) does help with recovery during and after intense workouts, so that's why I accepted the clothes and that is also what I'll focus on with this review. I liked that the legs were long enough for me to avoid the dreaded thigh-rub during my runs, and they also gave nice support to my hamstring. Not me again (hah, like you couldn't tell). The fabric feels amazing - it's so soft, and I really love the color. It feels great, but I'm not comfortable enough with my arms to wear this in public. However, it's great for doing my DVD workouts at home and when I ride my exercise bike. Me, modeling the socks. Dang, I put them on for the picture and am reminded of how good they feel. Why do they have to cost so much?! I really like these and want more! Honestly, all the pricing seemed pretty comparable to other higher-end technical/compression gear except for the socks. I'm still wearing some capris that I bought at least four years ago, so it doesn't bother me to spend a little more knowing that I'll get my money's worth...but the socks. I like them so much but there's just no way I can justify nearly $30 for a pair of socks, sadly. Tommie Copper has offered any of the pieces I've reviewed for a giveaway - so you can enter to win either the shorts, tank or socks. Leave me a comment saying what you'd like (don't worry, you can change your mind if you win) and I'll announce the winner on Friday, internet-willing. U.S. and Canada residents only. Thanks and good luck! FTC disclosure: I received the above-mentioned items for free to review. Tommie Copper will fulfill the giveaway. $29 for socks?!? They had better make me run faster, too! ;) Anyway, I think I'd try the compression shorts because it's probably the one "compression" item I haven't tried yet. this laady who is gonna RUN :-) would love the socks! I would love to win the compression shorts, I'm a walker and just beginning to explore the world of compression wear. I want the socks just because they are pink! Oh the tank or the socks. I am always up for compression shorts - I like that they keep the loose skin jiggle under control (being honest here). How am I supposed to pick just one? I love compression shorts and would like to try a different brand... never owned a tank... and I'm thinking those socks would be FAB for my left foot that I fractured and had the torn plantar fascia in. How can I choose? Please enter me anyway LOL! Socks, please! Just what I need for my plantar fasciitis. The compression shorts look awesome! I'm intrigued by the socks. Pricey, but I love a fabulous sock! Socks! I can never have too many! Wow, this stuff looks great. I would like to own it all of course, but would probably select the shorts. I don't own any. I noticed they have free ship if you buy 2 items right now. Great giveaway, I have their calf sleeves and wear them on the plane after races all the time. They are not as bulky as other sleeves, but get the job done. Would love to have the pants!!! Would love to try the shorts or the socks. Socks, socks socks!!! I would love the socks!!! I've been seeing this advertised a lot lately!! Would love to try the shorts! My bad feet would love to try the socks. I am thinking the shorts would be nice to try! I would love to try the shorts. Howdy! I'd like the shirt! I am always in need of compression shorts. I have such a hard time finding a pair that fits me correctly. I would love to win the socks please! The socks look very comfy! I would love to try them. I'd love to try the shorts! Another great giveaway!! I would love to try the shorts for biking! My sister-in-law wears the shorts when she walks. But since I don't like anything really tight around my legs or waist, I would like to be entered for the socks please! My hubby has the socks and loves them, however i'd love to try the tank or shorts. I probably should get the shorts, but I am intrigued by the socks -- I'd like to see just what $30 worth of sock feels like! I would choose the shorts. I have been "feeling" my hamstrings during my runs and after reading about your experience, I am a little paranoid about staying injury free. Maybe these would help me stay that way. Hmmm.... Looks like something worth a try! I'd go for the shorts or top! I'm always looking for shorts that would help avoid chaffing. I agree...That's very pricey for socks!!!! Well, since they'd be free in the giveaway, I'd love to try the socks! The pants seem like a good deal too. I'd love the try the tank or the socks. Nothing beats a free pair of socks - especially ones that are regularly $29.50! Yikes! I would love to win the tank! I tried on compression pants once and was a bit horrified at what I saw in the mirror, and I have yet to really figure out what size I am in women's tops, so I'd probably go for the socks. Who knew socks could be so expensive!! Definitely the shorts! I can't imagine my runs without compression shorts. Unfortunately, Wisconsin weather isn't exactly shorts-friendly currently, but come spring, those would be fantastic! Count me in! Those socks look incredible! Definitely the shorts - I love the length! The socks are tempting.....but I'd love the shorts! I think I would choose the shorts. Thanks, love Tommy Copper!